Favored for their relative speed, versatility, and translational relevance, humanized mice engrafted with human peripheral blood mononuclear cells (PBMCs) are the go-to preclinical models for evaluating T-cell-dependent immunotherapies. However, lacking important human cytokine signals, huPBMC-NOG and other PBMC models fail to support engraftment of important human immune cell subtypes, such as natural killer (NK) cells. This limits their utility for many studies. Recent work from Taconic Biosciences and Experimental Pharmacology & Oncology (EPO) scientists, however, indicates that two novel PBMC-humanized models are able to support human NK cells. In data presented at the 2018 American Association for Cancer Research conference, Taconic and EPO collaborators demonstrated that PBMC engrafted hIL-15 NOG mice are highly suitable models for studying human NK cells. Investigators from the Central Institute for Experimental Animals (CIEA) are credited for development of the super-immunodeficient CIEA NOG mouse® and its human cytokine-expressing variants, hIL-2 NOG and hIL-15 NOG. In previous work, CIEA scientists reported both hIL-2 NOG and hIL-15 NOG models could support the development of human NK cells from engrafted human hematopoietic stem cells (HSCs). Compared to the HSC engraftment approach, a PBMC model with sufficient NK-cell engraftment could provide a cost-effective and efficient alternative for in vivo studies of human NK cells and therapeutic human antibodies. Because the human cytokines in hIL-2 NOG and hIL-15 NOG were able to support human NK cells from engrafted HSCs, might they also sufficiently support NK cells following engraftment of PBMCs? The possible advantages for preclinical immunotherapy research encouraged further study. To determine the suitability of PBMC-engrafted hIL-2 NOG and hIL-15 NOG for NK-cell investigations, EPO and Taconic scientists designed a study comparing immune system reconstitution from PBMCs in both transgenic models to conventional NOG mice. 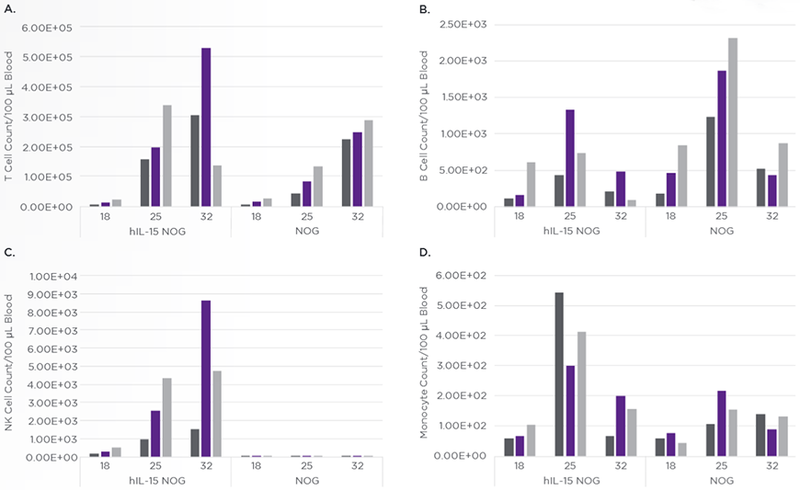 NOG, hIL-2 NOG, and hIL-15 NOG mice were engrafted with several doses of a single donor's PBMCs, then peripheral blood immune cell reconstitution was evaluated in each model over time. Because T-cell-mediated graft vs. host disease (GvHD) limits effective study windows in PBMC models, the onset of GvHD was also monitored and served as a primary consideration for model suitability. Compared to conventional NOG, the overall survival for hIL-2 NOG mice was severely decreased post engraftment. Even at the lowest PBMC dose (2.5x106 cells), all hIL-2 NOG mice manifested signs of severe GvHD and were pulled from the study just short of two weeks post engraftment (Fig.1). Despite early GvHD onset, PBMC-engrafted hIL-2 NOG mice did reconstitute human NK cells at levels in excess of 100 fold compared to those found in NOG mice (Fig.2). The limited study-window following PBMC engraftment does rule out PBMC-engrafted hIL-2 NOG as a suitable model for most studies. However, hIL-2 NOG mice did show excellent engraftment rates for NK cells. Alternative engraftment approaches (e.g. using purified NK cells) may avoid or delay GvHD onset and enable human NK-cell studies in hIL-2 NOG. 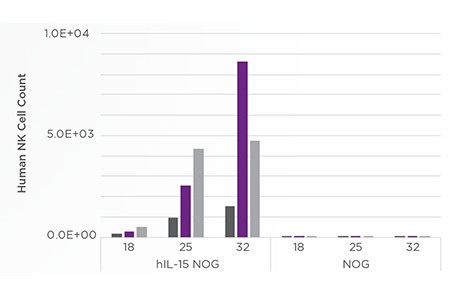 PBMC-engrafted hIL-15 NOG mice had a slightly diminished survival compared to conventional NOG mice, but did survive up to seven weeks after PBMC engraftment without any signs of GvHD (Fig.1). The shorter time to GvHD onset was associated with slightly higher rates of T-cell reconstitution (Fig. 3a). Taconic and EPO collaborators observed slightly decreased B-cell reconstitution and marginal increases in monocyte reconstitution in hIL-15 NOG vs. conventional NOG mice (Fig. 3b,d). However, the effects on the human NK cell compartment were far more striking. Dose-dependent increases of NK cell numbers were observed in hIL-15 NOG and total human NK cells were markedly higher at each time point vs. conventional NOG mice (Fig. 3c). hIL-15 NOG mice engrafted with human PBMCs offer significantly enhanced human NK cell reconstitution and only slightly reduced study window compared to conventional NOG mice. Furthermore, engraftment of human NK cells required no preconditioning, such as irradiation or busulfan. Taken together, these data reveal PBMC-engrafted hIL-15 NOG is a highly suitable humanized model for studying NK cells.